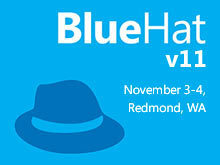 The primary objective of the BlueHat Conference Series is to build bridges between Microsoft developers and executives, key security program partners, and members of the security research community while educating the greater Microsoft population on security threats and mitigations. BlueHat v11 again brought leading external security researchers to campus to present timely and lively presentations that showcased ongoing research, state-of-the-art security tools/techniques, and emerging security threats. Our main themes for BlueHat v11 focused on threat landscape, web application security, cloud security, and the security ecosystem. Get the latest conference news from internal Microsoft speakers and external community members.